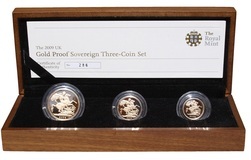 Gold Sovereign, 1980 Proof Boxed with certificate FDC. 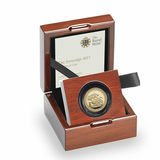 UK, Gold 2001 Brilliant Uncirculated Five Pounds,Containing almost 40gms of 22 Carat Gold. 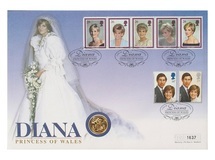 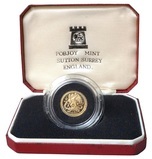 2003 Brilliant Uncirculated Gold Five Pounds Containing 40 grams of 22 Carat Gold. 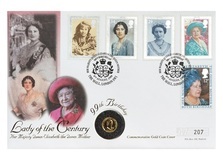 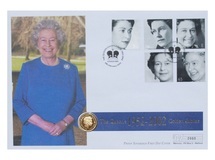 Gold Sovereign, 2002 Golden Jubilee Proof, first Day Cover FDC. 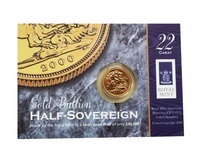 Gold Half Sovereign, Issued for the 'Queen's Golden Jubilee' Royal Minr sealed in Pliofilm Packet, best available in Brilliant Uncirculated grade. 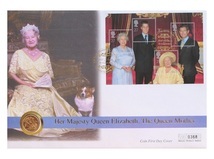 Alderney, 2002 Gold £25 Coin, Commemorating The Queen's Golden Jubilee 1952-2002.